Today the Mozilla group released Firefox 3.5. This release has many new features, but one that really interests me is the inbuilt geolocation service. This release also comes hot on the heels of the iPhone OS3.0 software upgrade that also brings inbuilt geolocation to the mobile safari browser. Why is this exciting? They are both based upon the W3C geolocation specifications. 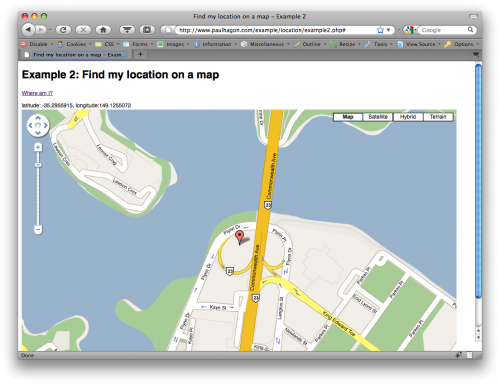 I’ve previously written about geolocating using various browser plugins. This is a messy way of doing it and required a lot of code forking to cover the different possibilities. Now we have a standard way of doing this type of thing. Let’s start by creating a call to the browsers in built location service. We need to firstly check that the browser supports location services. If it does, then make a call to try and get our location. If we get a successful location we can display the latitude and longitude. We may also get an error. This may occur if the user decides not to share their location or there is an error in the system. We are now able to display our current latitude and longitude – see example 1. Now that we have a latitude and longitude it’s much easier to visualise our location if we plot it onto a map.We will keep the same basic code and add some Google Maps script to it. Now it is much easier to determine our location by turning the numbers into something visual and meanignful. Try it out in example 2. Now you have the basics of obtaining a latitude and longitude, you can start to use these techniques in your own applications to display locations or items that are relevant to the user in that location. This entry was posted on Wednesday, July 1st, 2009 at 3:21 pm	and is filed under Blog. You can follow any responses to this entry through the RSS 2.0 feed. Both comments and pings are currently closed. i looked for other examples that i couldn’t follow much and finally found this article that really helped! Hi Great article thanks when i follow your instructions everything looks fine although the map only turns out about 1cm big, is there a default setting that I can you to change the map size? Tim, you can make the map any size you like by setting CSS properties for the width & height of the map.